Twenty years ago, I wrote a list of three life goals. 1. Learn to make a good pasta salad. 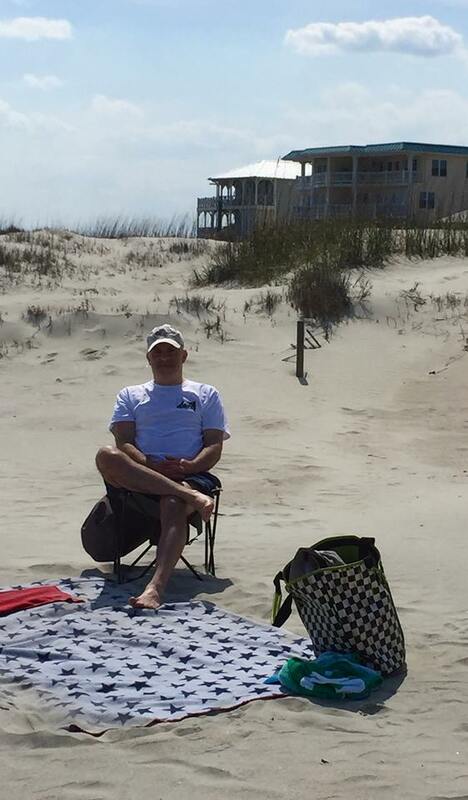 So far I am 2 for 3, and still working on traveling the United States. 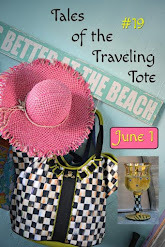 What is a Traveling Tote, and why are we doing this you say? 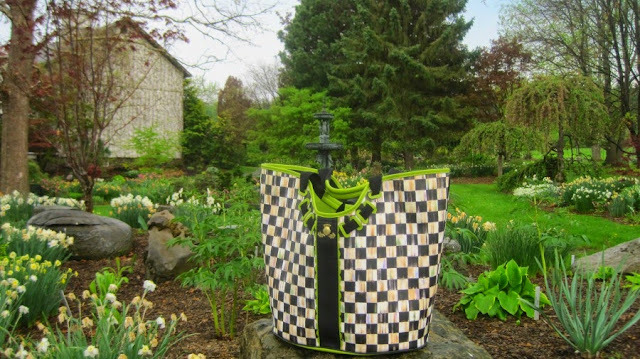 It all started in January when a text message was sent to me by the very observant MacKenzie-Childs collector Patti @ Pandora's Box telling me that the Courtly Check tote bag was on sale and that we might want to take advantage of the reduced price. After I bought mine, she contacted Sarah at Hyacinths for the Soul because she thought she needed one too and the more the merrier. (Patti could have a second career as a personal shopper) Linda at More Fun Less Laundry (love the blog name) wanted some fun too, so let the adventures begin. Can't wait to see where these ladies and their totes have been. 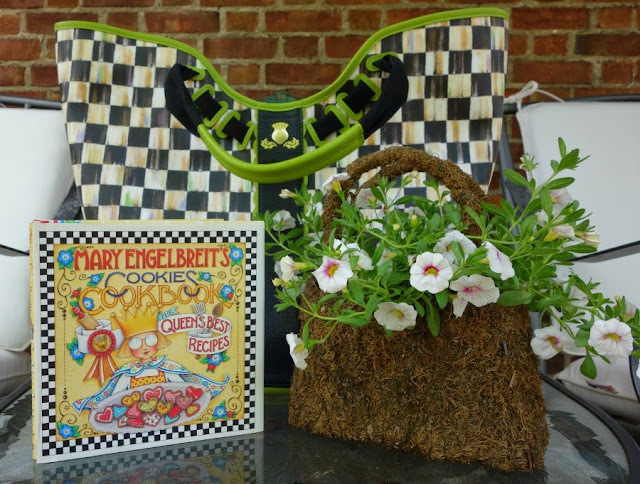 My two friends Tami and Colleen are also MacKenzie-Childs "collectors" so we invited them to share their adventures. Sorry, neither of them have blogs. Tami might share a photo of her sweet self this summer, and I'll include it in my September post. Miss Aurora's maiden voyage was to Tybee Island in March. She enjoyed leaving the snow behind, and going to the beach. 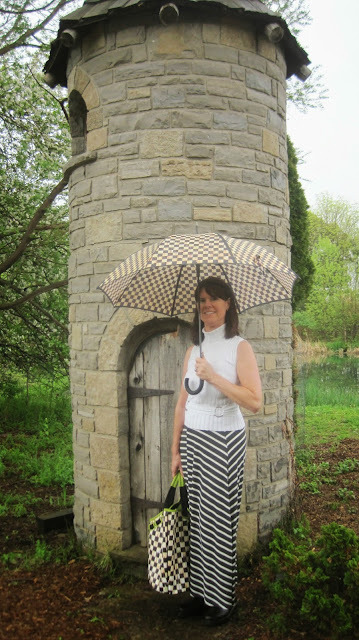 Over Mother's Day weekend, Miss Aurora transported picnic items to a private 35 acre garden in the village of Marcellus. 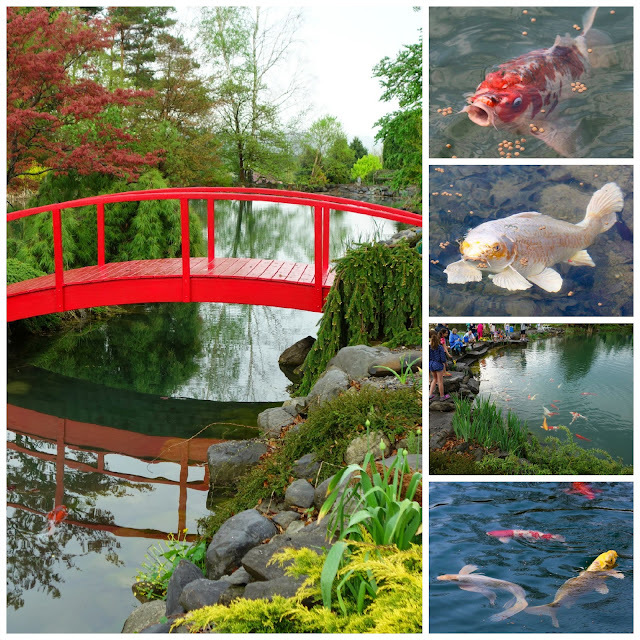 A few times each year, the Hanford family graciously open their gardens to the public with proceeds going to benefit a local non-profit agency. Miss Aurora went to our camp over Memorial Day Weekend. She said I stuffed her too full and brought everything but the kitchen sink. The tote has a roomy interior so it's very tempting to overload it. 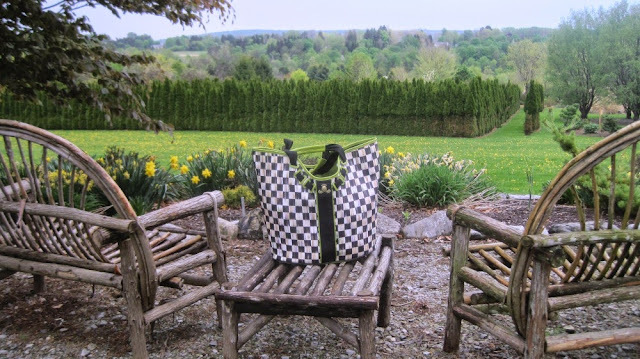 Miss Aurora and Miss MacKenzie Joy attended the Country Living Fair in Rhinebeck, NY and the chic tote was filled with a bottle of champagne, crackers, strawberries and cheese. We loved the Rhinebeck and Hudson Valley area, and read that National Geographic Traveler proclaimed the Hudson Valley region as one of the top 20 destinations in the world. It's designated a National Heritage Area is steeped in history, natural beauty, culture, and a food and farmer’s market scene. While Miss Aurora was waiting in line for a tour of Old Savannah, she decided the pirate would look mighty handsome holding the tote. Miss MacKenzie Joy (Colleen's bag) made her debut in February to celebrate birthdays with a group of friends at Zeina's. Miss Aurora went to the Mirror Lake Inn in Lake Placid in February. Not exactly an exotic journey in the snow, but a fun adventure. Cherish your friends and the memories by doing crafts together. We are a group of seven women that get together on a regular basis and we recently celebrated two birthdays and made it a crafting day. 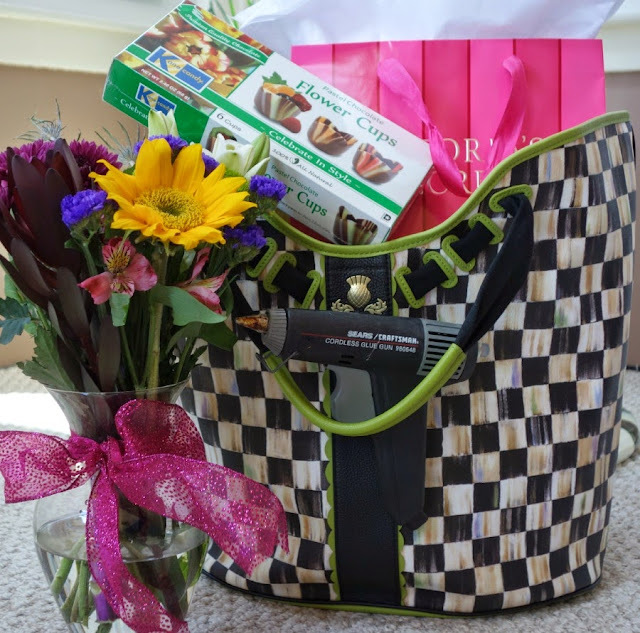 I enjoyed filling the tote to the brim with gifts and supplies. 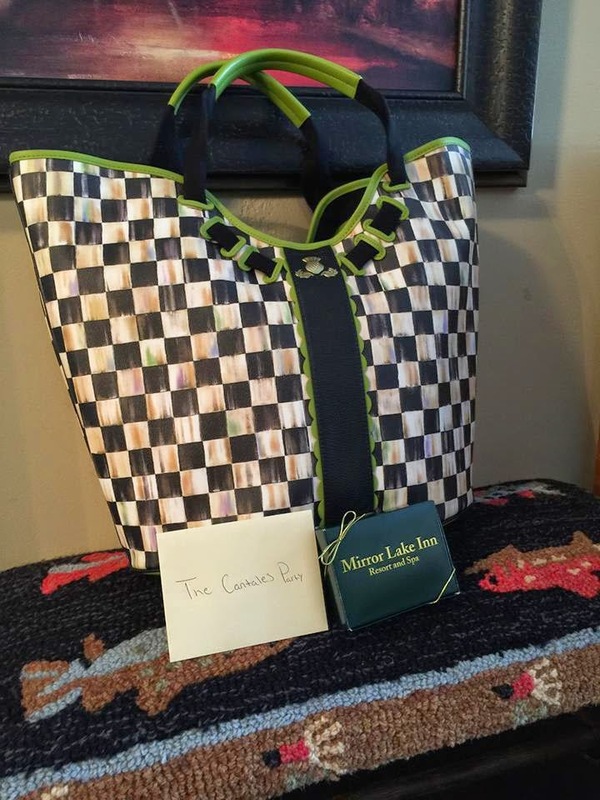 Tami's tote, Miss MC la Mer. went to a needlepoint class. She also loves going to Cape May and thus her beautiful name. 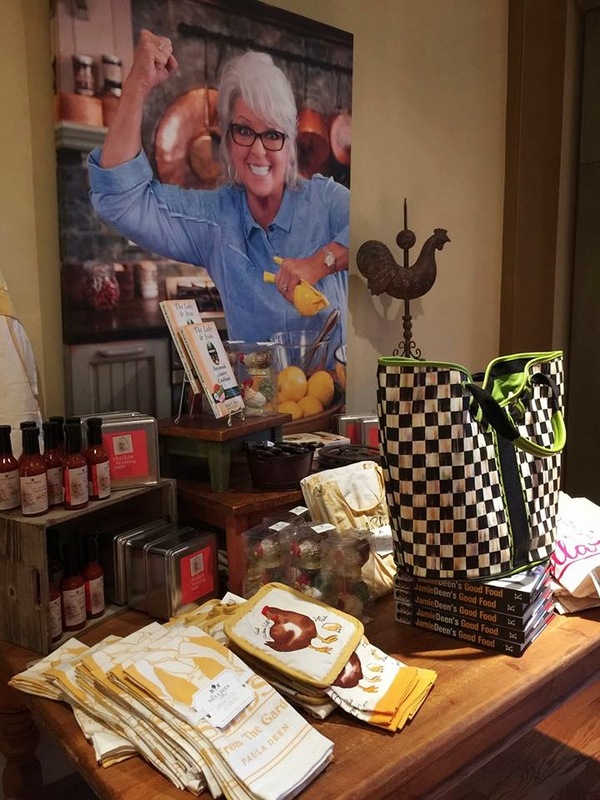 Miss Aurora was seen visiting Paula Deen's restaurant in Savannah in March. centuries-old seaside villages on the rugged Italian Riviera coastline. In each of the 5 towns, colorful houses and ancient vineyards cling to steep terraces. If you enjoyed this post, come back in September to see what Miss Aurora did over the summer. 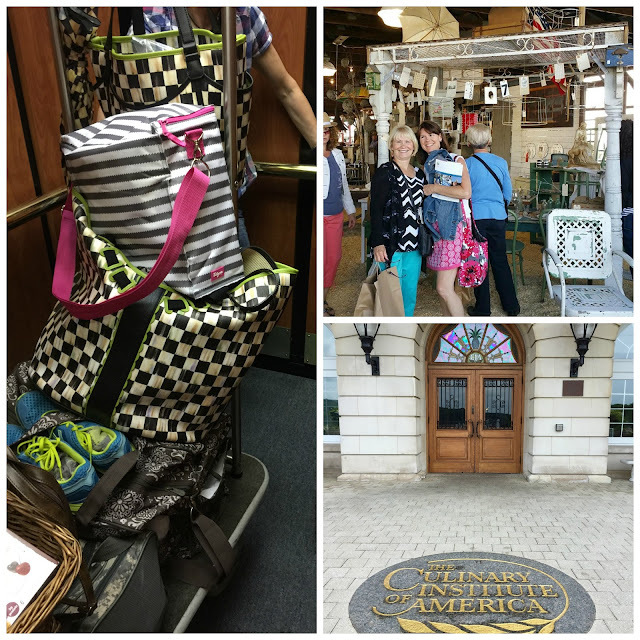 Great post and what wonderful traveling memories! Love the pirate! Hoping someday all of our totes can meet and travel together!! Such a sweet post..instead of the traveling pants..the traveling totes..
Looks like the perfect size for any type of traveling...hope you have a chance to take Miss Aurora to the Italian Riviera and stuff her full of goodies to bring home! 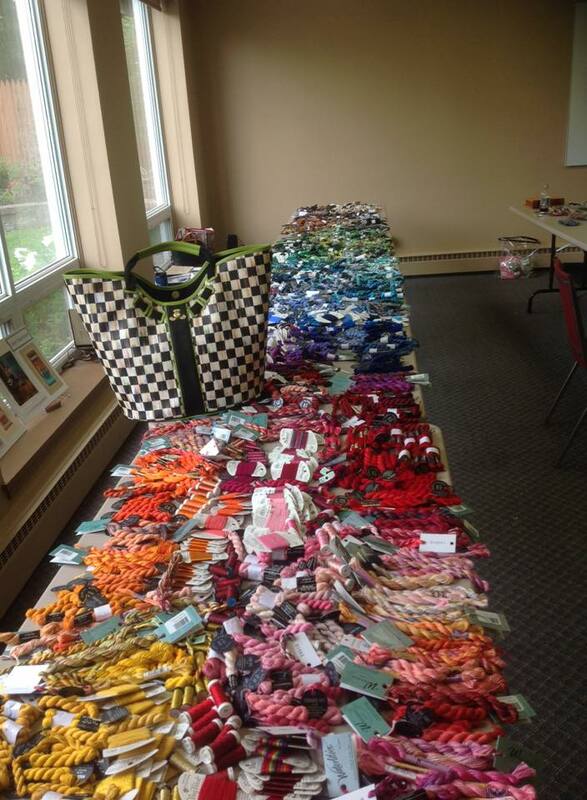 What fun what fun, to see your escapes through the "eyes" of your travelin tote Debbie!! Oh how I wish I could drive a big truck to the annual McK-Chds summer sale! Love the Waterlogue photos that you and Patti included. I need to start using that app again. A beautiful, whimsical journey of a tote. She even made friends with a pirate! I like her already. Dreamy, evocative photos and lively commentary--fun, fun, fun! 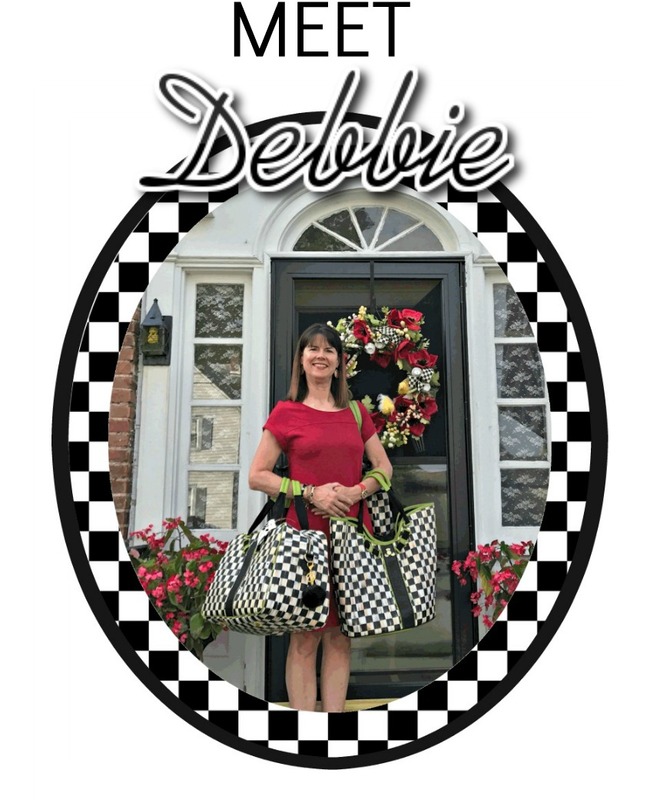 I enjoyed my travels with you and Miss Aurora, Debbie! You both know how to travel with style! 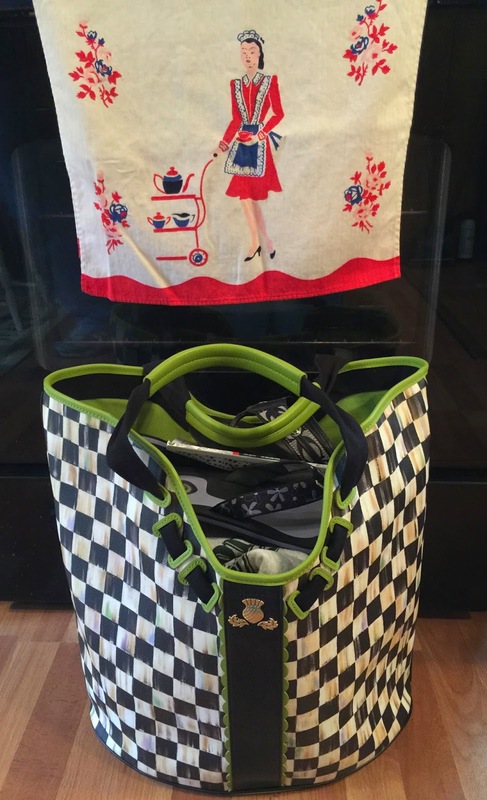 The pirate holding the tote gave me a chuckle this morning and I so love your idea of dreaming of your trip to Italian Riviera one day. Oh to be a member of The Pampering Club. However, your idea of Friends of the Traveling Tote is much more adventuresome in spirit. 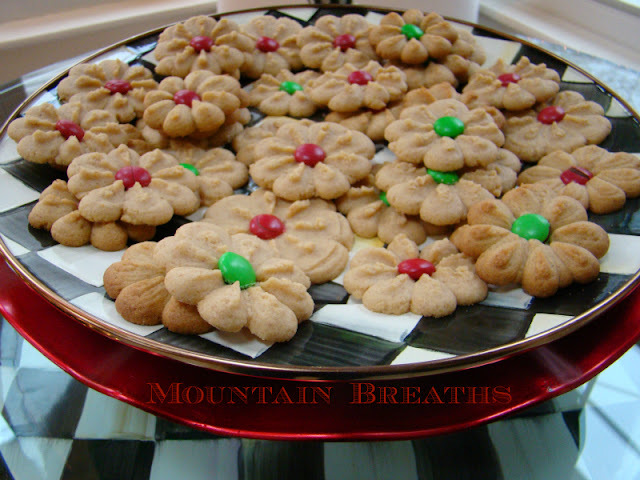 Thank you for the cookie at the beginning. Now how about that pasta salad recipe....? Fun post!! Kitty, I'd be happy to share the pasta salad recipe. 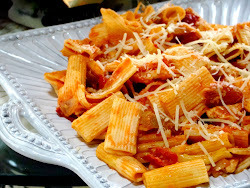 The recipe came from Italy and even my hubby loves it. (He is Italian and never liked pasta salad). I'm glad you enjoyed it! Thank you for the visit. Oh Debbie, what a wonderful trip! 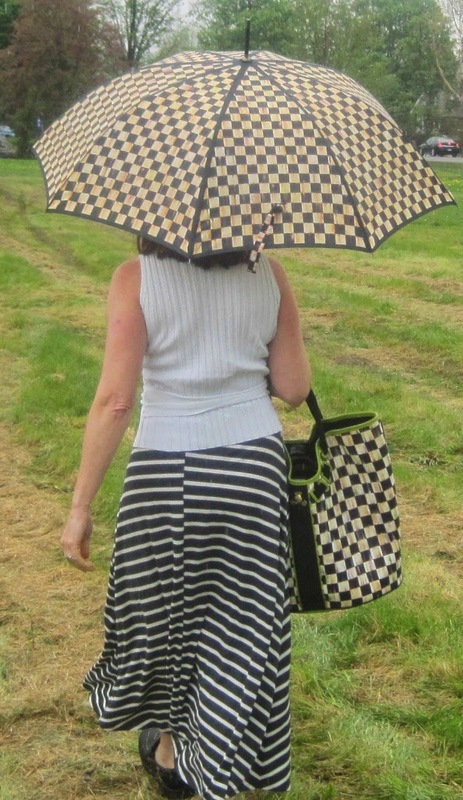 You look great in your black and white outfit and that bag is to die for! I wish I could join you and Patti for such fun. Wounderful post, I so enjoyed it! Fabby, we would welcome you to join us! Sorry I didn't get to join in with my faux MC. Health issues had to come first.